Here you can read some of the comments our customers have said about Simply Colors. Because we think that the best reference is when it comes from a customer who has already made a purchase at our store, we have chosen for a 'closed' guest book. Doing so, only customers who actually have ordered and received our products are able to upload a comment. This makes the testimonials most valuable! You can add a review and attach a photo with your unique link that you received by email or you can email your photo and comments to our customer service and we will upload for you. I placed an order, got it in very good time and was very pleased with the bag. I'm sure my niece will like it as well, especially as it's personalised. The only problem I have now is that I'm also sure my other nieces will be wanting one too. Many thanks and more power to Keely, a good and honest businesswoman who takes the time to return calls timely and treats her customers very well. My daughter loves her bag, it's so different and looks really good. Delivery was really quick. Really pelased with my daughter's book bag! Thank you & speedy delivery too! I'll be back soon! Thank you so much for my vest for my niece.... It looks fab and went down very well with my sister! Looks great, arrived quickly and will definately being using simply colours again! Absolutely delighted with the new rucksack - it's a perfect size for my 5 year old for school. Both my girls already have messenger bags for gym / dance so this was our third bag from simply colors. All the bags are much admired at school and clubs! Very pleased with order, good quality garment. Will look to order again. My son loves his new bag with his name on it, he says it's great!! His friends are envious. THANKS SOO MUCH. We are really pleased with Oscar's bag. The service was great and the bag is of high quality and he loves it. He will look really smart on his first day carrying his new bag with him. Thank you. I would certainly recommend your company to others. T-Shirt arrived promptly. It looks good and seems good quality. The birthday girl was happy! Got a messenger bag for son when he started nursery and was so impressed and now buying for all the family! It well made, brilliant value and I'm always being asked where I got it! 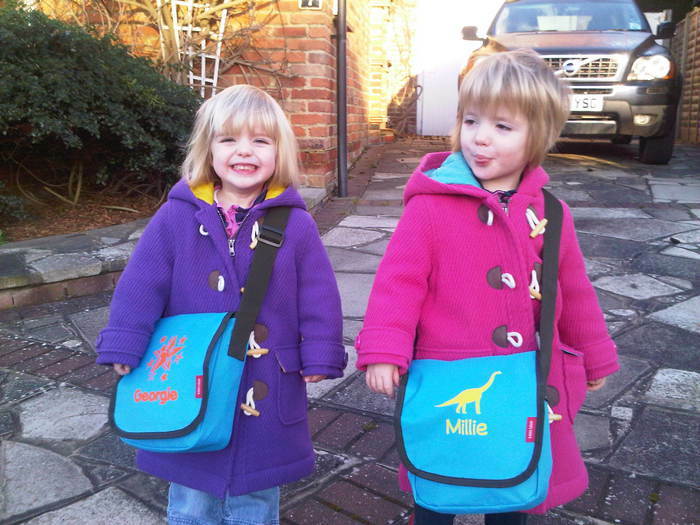 Fast fantastic product and service - boys loved their new school bags and as they helped to design very proud of them. Garment arrived on time, accurate printing and of good quality material. Will use your service again. Thanks.